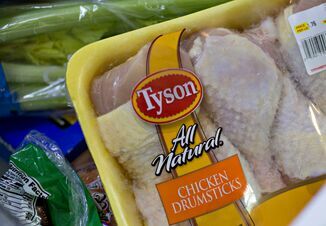 Tyson Foods Inc. shares turned higher on Monday on last-half profit optimism after its quarterly profits missed Wall Street estimates as the biggest U.S. meat processor felt the brunt of higher freight and labor costs, sending its shares down nearly 6 percent in premarket trading. 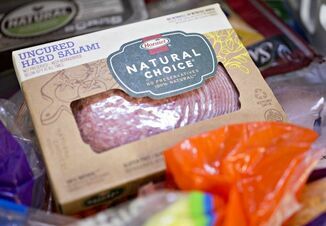 Tyson, like other U.S. meat processing and packaged food companies, has been facing higher transportation costs as railroads and truck fleets have raised prices amid a shortage of drivers, reduced capacity, higher fuel prices and a strengthening U.S. economy. The rise in freight costs had a net effect of about 14 cents per share for the quarter, with a full-year estimated impact of roughly $250 million, up from the first-quarter estimate of $200 million, Tyson Chief Executive Tom Hayes said on a conference call. Inclement winter weather during the first quarter at times disrupted production at meatpacking plants, presenting further challenges for Tyson as well as other companies such as Smithfield Foods Inc. and JBS. Tyson’s shares dropped in initial trading in response to the earnings news, but later rose from opening lows in anticipation of fewer challenges facing the industry with respect to freight and labor issues in the coming quarters. Shares were up 23 cents, or 0.34 percent, at $67.20 in late morning trading on the New York Stock Exchange. “We think the back half of the year looks a lot stronger and that’s positive for our business,” said Stewart Glendinning, Tyson Foods’ chief financial officer. Hayes said the company was not significantly affected by the 25 percent additional tariff on U.S. pork imposed by China in early April in response to higher duties by Washington on Chinese steel and aluminum. Tyson sells less than 0.5 percent in total pork sales to China; in 2017 that was about $150 million, said Hayes. From January through March 2018 total U.S. pork exports to China/Hong Kong declined 15 percent from the same period last year to 111,681 tonnes valued at $260.7 million, due to rising Chinese production and falling hog prices, according to the U.S. Meat Export Federation (USMEF). China’s additional 25 percent tariff on U.S. pork imposed in early April was not reflected in the 2018 first-quarter results, the USMEF said. The maker of Ball Park hotdogs and Jimmy Dean sausages is also facing higher feed costs as prices of commodities like soybean and corn increase. It expects chicken feed costs to rise by about $100 million in fiscal 2018. 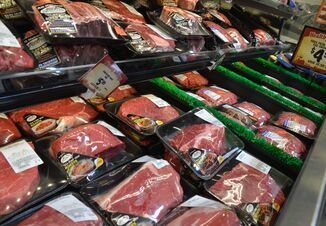 Tyson also lowered its fiscal 2018 sales forecast range by $1 billion to between $40 billion and $41 billion. For the second quarter ended March 31, net income attributable to the company fell to $315 million, or 85 cents per share, from $340 million, or 92 cents per share, a year earlier. The company paid $109 million in onetime cash bonuses to its employees across its businesses as it passed on the benefits on of changes in the U.S. tax code. Excluding certain items, the company earned $1.27 per share, while revenue rose 7.6 percent to $9.77 billion. Analysts on average had expected earnings of $1.30 per share on revenue of $9.89 billion, according to Thomson Reuters I/B/E/S.